Fiona Weir should be acknowledge for casting such a brilliant ensemble of actors. They all played their roles so wonderfully. There were just a couple of marks that I was uncertain about, but I think it was due to my unfamiliarity with the actor in question. It may have been a choice of character as opposed to his acting in general, but this is the first performance I have seen from him. I will say that I do hope to see more of him. I would like to particularly highlight the performances of Bill Nighy and Imelda Staunton, who were both just brilliant as ever. (Seeing Imelda Staunton get her groove on to Dead or Alive’s “You Spin Me Round” was priceless.) Also George MacKay, who played the young, closeted Joe, was quite excellent and adorable. A sharp, witty, and poignant script that really captures the struggle of the time. There were a couple moments that I felt could have been cut, because I don’t think they really did anything to progress the story, but I don’t think they detracted from it either. Though none of the characters are of any ethnicity other than white, there are several gay/lesbian characters. And about half of the (leading) ensemble are women. At least one of the actors is actually gay. And I don’t think the women ever discuss a man, per se. Seeing the snow-covered hills of the Welsh countryside was positively breathtaking. The scoring was perfect; it fit the time and story of the film. Sometimes, though, it was hard to hear the dialogue over the music. 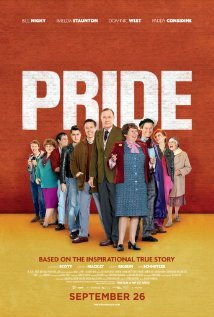 Based on the true story, gay activists in the U.K. work to help miners during their lengthy strike of the National Union of Mineworkers in 1984. The story is compelling, both heartwarming and heartrending. It is an important piece of cinema for gay rights. The scenes felt neither rushed nor dragged-out. Though its main character is (slightly) self-indulgent, this film is humble and unassuming. That isn’t to say that it’s a small and unimportant film, because it’s not. It tells its story and spreads its message with a modest, yet powerful, voice.